Star Wars is famously inspired by Japanese samurai films. So it makes sense for Bandai to release this wonderful Samurai-style Darth Vader. 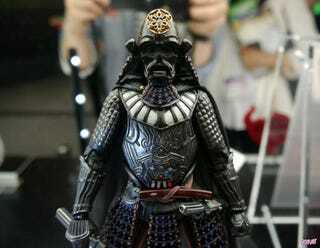 Dubbed, "Movie Realization Samurai General Darth Vader," the figurine was recently displayed at the Tokyo Toy Show. Designed by Takayuki Takeya, the 7.8-inch figure is slated for a winter 2014 release in Japan. Price is TBA, reports IT Media. Did you know that George Lucas apparently offered the Darth Vader role to Toshiro Mifune? According to Mifune's daughter, the Star Wars creator did.